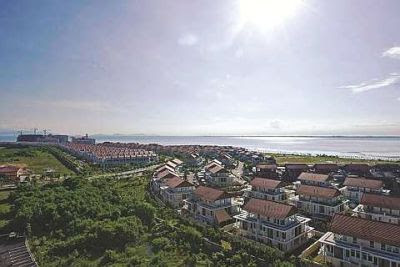 An aerial view of Seri Tanjung Pinang phase one in Tanjung Tokong. As a stake owner, Sime Darby can take part in the development project. CONGLOMERATE Sime Darby Bhd's 30% stake purchase in niche property developer Eastern & Oriental Bhd (E&O) will allow it to build two strong property brands with different strengths. Instead of being confined to its own landbank and property product segment, the stake purchase and three-year collaboration agreement with E&O should allow Sime Darby to gain expertise in higher-end property products, says Sime president and group chief executive Datuk Mohd Bakke Salleh in an interview. Although the conglomerate is one of the largest property developers in Malaysia, it has traditionally focused on township development and mass housing, but its recent entry as an E&O shareholder propels it into the higher-end market as E&O specialises in creating luxury lifestyle living spaces and high-rise developments. “With the strategic stake in E&O, we take a view that E&O's business model and culture can be pushed onto our guys, specifically for the high-end market products. Overnight, we would be involved in the development (of E&O's projects) in the country and outside,” he says. Bakke says while one can be an active property player, the challenge lies in moving into developing high-end products, where the margins are higher. The deal puts a process in place for Sime Darby to strengthen its expertise and capabilities for niche products, as Bakke emphasises that as opposed to building expertise from ground-up, it has instead taken an opportunity to have a piece of a developer that has already carved out a niche. Sime Darby Property will second some of its staff to be exposed to E&O's operations and the rigours of the market place. The company is also expanding its property strength by recruiting more property employees, with two to three senior management employees as well as a new property chief. On Aug 28, Sime Darby announced its plan to buy a 30% stake in E&O for some RM766mil. It is seeking to buy 273 million shares and 60 million irredeemable convertible secured loan stocks, amounting to 30%, from three vendors E&O managing director and founding member Datuk Tham Ka Hon, Tan Sri Wan Azmi Wan Hamzah and Singapore-listed GK Goh Holdings Ltd.
Before the deal was announced, market talk had been rife for a while that E&O's key shareholders were looking to divest their stakes, with the market speculating that property player SP Setia Bhd was looking to buy into the former. While SP Setia dismissed such talk, the E&O shareholders were still said to be in talks with other bidders. “The discussion period for the deal was very short as we learnt about this opportunity and jumped at it. It was about two weeks before Hari Raya,” says Bakke. Post Sime Darby's announcement, many questioned the rationale behind Sime Darby's high premium paid for the E&O shares, which amounted to 60% at an offer price of RM2.30 per share. However, Bakke defends the high premium paid owing to the potential upside seen in landed assets in years to come. He adds that other stakeholders in the market place have paid similar premiums for strategic stakes, only to see investee share prices more than double years later. “A lot is dependent on value creation within the company. We are comfortable with the price and we are going in as a long-term investor,” he says. The initial asking price of RM2.50 per share by the vendors was reduced to a final offer price of RM2.30 per share. Sime Darby estimates that the deal is a 20% discount to E&O's realisable net asset value of RM3.2bil. Bakke adds that the value of E&O is underpinned by its management led by managing director Tham and his next in command, deputy managing director Eric Chan. While Tham has given his commitment that he will remain with E&O for the next three years, Bakke says there is a possibility he will remain beyond that time frame. But should he decide to leave, Chan is more than capable to take over. 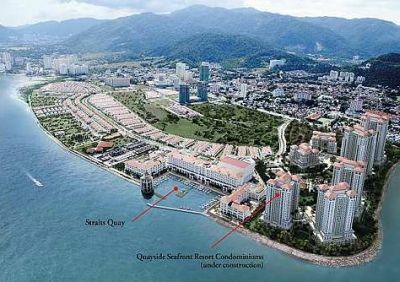 E&O's largest project and its prized-jewel is the 980-acre Seri Tanjung Pinang seafront development in Penang. The Sime Darby-E&O deal effectively gives Sime Darby the opportunity to take part in the Seri Tanjung Pinang 2 project, which involves reclaiming 740 acres in Tanjung Tokong to develop two islands for mixed development projects. The project has an estimated gross development value of RM12bil. Both parties also entered into a collaboration agreement for them to share knowledge and expertise, leverage on each other's core competencies and exploit mutually identified economic opportunities for three years. Bakke says that mixing with other developers allows one to pick up traits from the other and extract optimal results. Meanwhile, news reports earlier this week raised questions as to whether Sime Darby will be required by the Securities Commission (SC) to launch a mandatory general offer (MGO) for the remaining shares in E&O. While the Takeover Code states that an MGO is only triggered by a 33% or more change in shareholding, there are other instances in which an MGO can be required by the regulator. According to Para 6.2 of Practice Note 9 of the Takeover Code 2010, the SC has the right to consider all surrounding circumstances to deem if control has been passed to a new party, thereby mandating the new party to launch a general offer (GO). Among the specific criteria laid out in Para 6.2 is “the consideration for the acquisition of the voting shares” in other words, the premium to market that was paid for those shares. Other criteria that will be looked at include changes to the composition of the board and to the business of the target company. While the SC told StarBiz that it was examining the circumstances surrounding the transaction for any Takoever Code implications, Bakke says that Sime Darby has not been engaged in any discussions with the regulator pertaining to a GO. As for why Sime Darby did not opt for a GO for E&O shares from the get-go, he says Sime Darby wanted to enter as a stakeholder with the right stake size to have a feel of E&O's operations. “At an appropriate time, we will do a GO (if we think it is appropriate). Since it (E&O) is a listed company, we could not do a due diligence or a feasibility study (for the stake purchase),” he adds.